I was able to give Al (artistmonk) her wee kitty last year in early October. 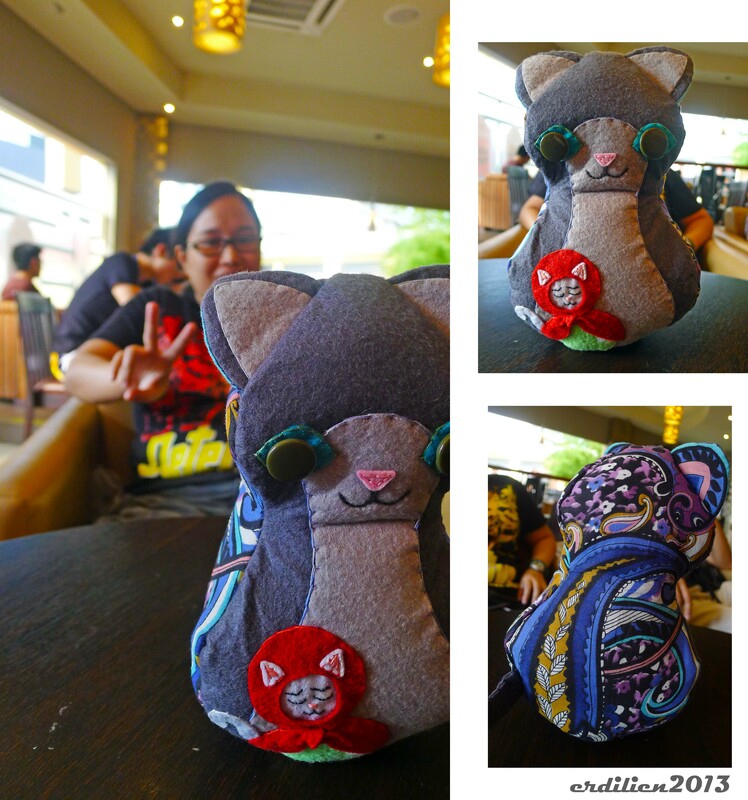 I wasn’t able to take proper shots before giving it to her, but I did get some at the coffee shop where we met up. Al wanted a Russian blue cat. 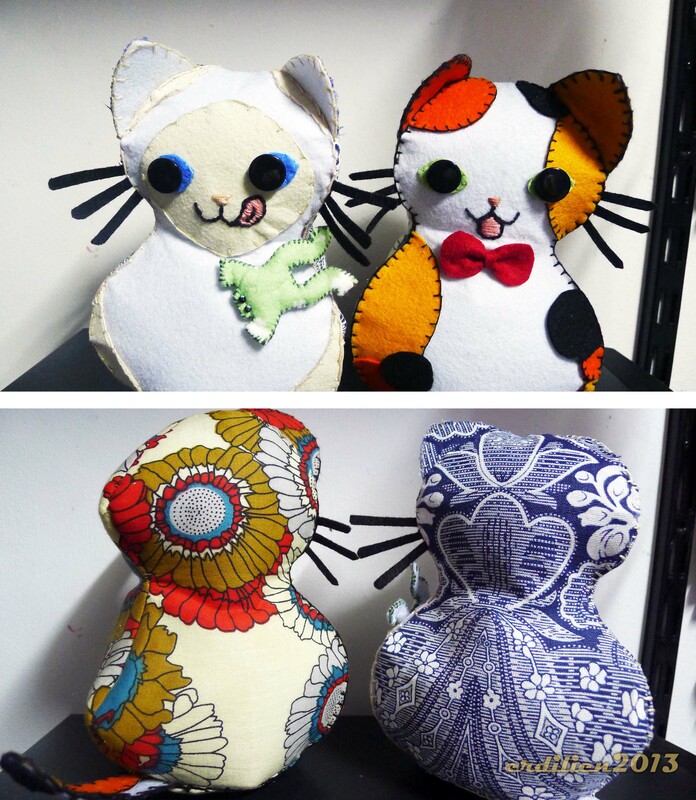 When I was sketching the design, I remembered a comment about the first kitties I made — that they looked like matrushka dolls. Well, since the Russian blue is from Russia, I thought I’d give Al’s wee kitty her own little matrushka. I’ve procrastinated in finishing the latest of these (procrastinating on a project that was started to procrastinate something else…). This was partly because I was trying to figure out a way to make sewing on the bottom part of the softie easier. Looking at the Russian blue wee kitty, she didn’t “sit” properly (you couldn’t see the little kitty matrushka properly). But I did eventually figure out a way that works for me. A much “cleaner”bottom. This is actually the most challenging part of the pattern, I think–but I finally found an easier way to do it. I did a quick running stitch along the bottom of the edges and pulled the thread to gather the fabric, making the bottom rounder, then secured it with a loose knot. 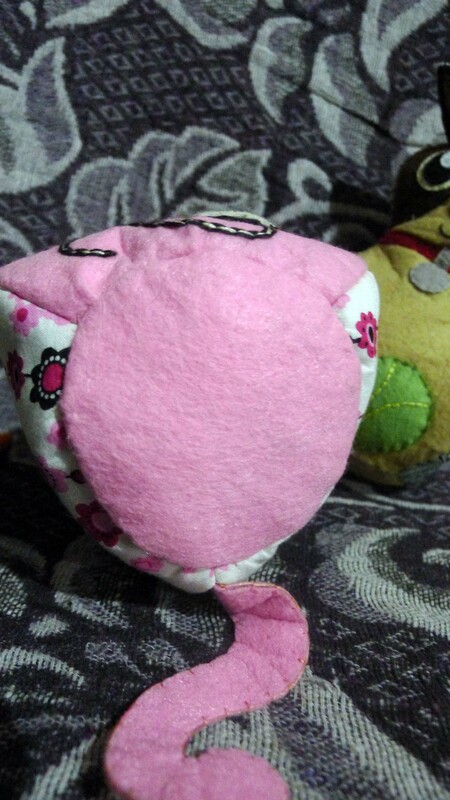 I also did the same for the circle that’s suppose to fit on the bottom (similar to making a fabric yo-yo). You can then secure it to the bottom using slip stitches. When a friend asked if I could make her a cat for a little girl, I knew I had the perfect fabric for it — a sakura (cherry blossom) print. 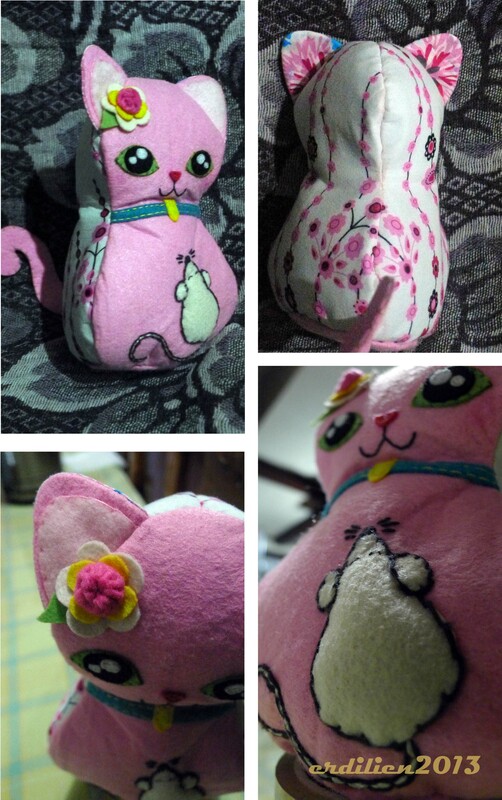 So I thought it would be cute to make a pink cat to match the fabric. To the question “Are there pink cats?” – well, yes, kind of: the hairless kind. The pattern pieces all cut out and ready. The printed fabric was a bit too flimsy especially compared to the felt, and the difference in the weight of the materials made it a bit difficult to work with. So I decided to line the printed fabric with felt as well. This orange tabby is for another friend, inspired by his mischievous cat Siopao (formally known as Schopenhauer) — who is actually an offspring of my own cat. I haven’t given the wee kitty to my friend yet. When I asked him what accessory he wanted on his softie, he said a whip would be appropriate. I used faux leather from an old bag for the whip’s handle. Siopao the wee kitty looks really mischievous here! 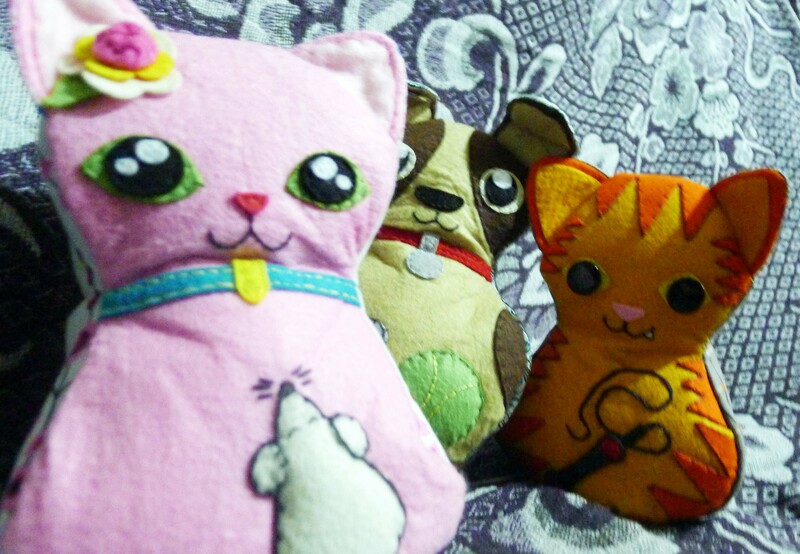 I just need to send the pink cat and beagle via courier to my friend. I actually want to see her reaction when she gets them, but I said I’d ship them instead, so I could try out shipping items (part of my research into selling some of my stuff in an online shop — something I’ve been dwelling on for some time now.) But of course, since these were adapted from a free pattern, I won’t be selling them. 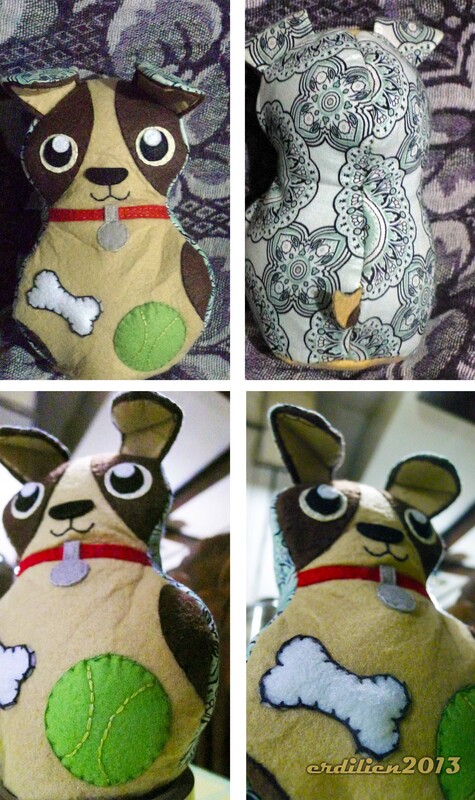 Even though I’m starting to experiment with my own patterns and designs, I ‘ll probably make more of these in the future – maybe make versions of my cat and our family dog. 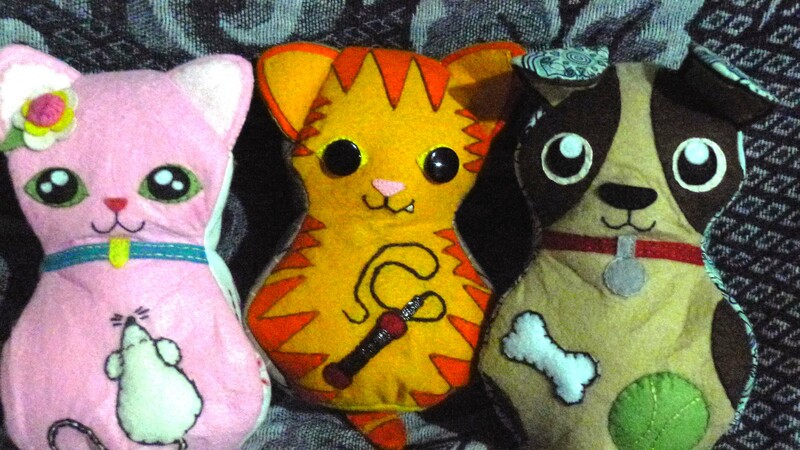 The pattern is easy enough for a beginner, but at the same time its challenging and fun because of the many possibilities in embellishing and personalizing the softies made from the pattern. It’s a great way to use up scraps of print fabric, too. You can view the gallery of wee bunnies that other crafters have made on flicker here. 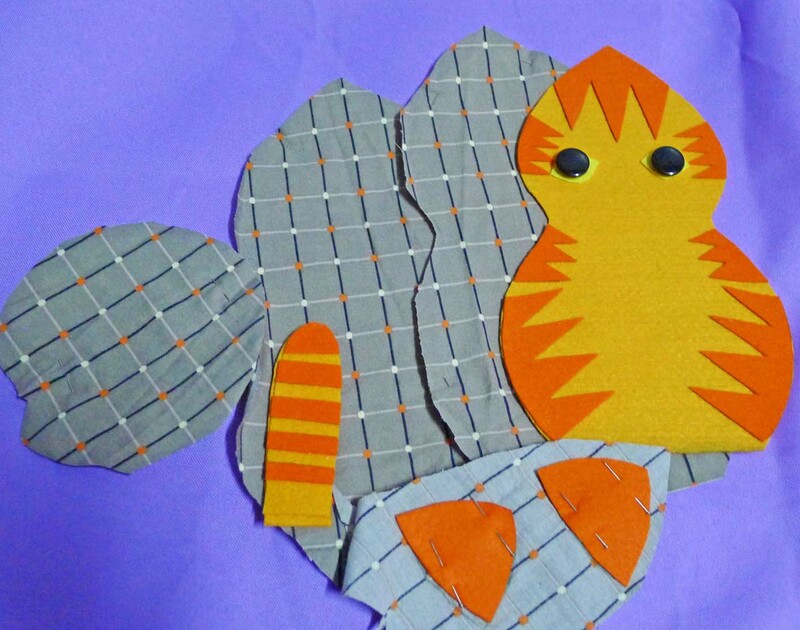 This entry was posted in Celebrations, Felt and tagged bunnies, cats, felt, free patterns, handmade, kitties, print fabrics, puppy, softies, toys, Wee Wonderfuls by erdilien. Bookmark the permalink.